As the CTO for OGD ict-diensten, a Dutch managed service provider (MSP), I try to spot market opportunities for my region early and often. We live in a new paradigm where software is eating the world, so it’s crucial for me to keep up with new technology whenever and wherever possible. This is why I attended and presented at VeeamON 2015 and learned about the much-anticipated Veeam Availability Suite v9 and all the awesome new features it delivers for MSPs. As the lead for our Infrastructure as a Service (IaaS) practice, I am heavily involved with numerous technologies, and of course, Veeam is one of them. Besides using Veeam in the usual case of backing up and restoring both tenant and infrastructure workloads running on our platform, we’re also leveraging Veeam for Backup as a Service (BaaS) and Disaster Recovery as a Service (DRaaS) purposes. My experiences with Veeam Cloud Connect are based on the three practices of IaaS, BaaS and DRaaS. Recap: What’s Veeam Cloud Connect again? Veeam Cloud Connect is a technology that allows a service provider to easily set up and maintain a secure multi-tenant environment for hosting off-site backups and replicated VMs. I’m guessing you’re all familiar with the 3-2-1 Rule for data Availability. If you’re not or need a refresher, please visit the blog post on the subject written by my good friend Luca. 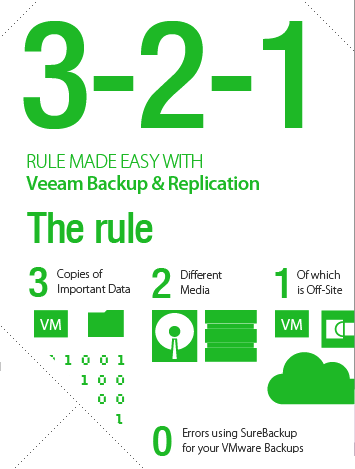 Veeam Cloud Connect is a feature of Veeam Backup & Replication and has a cloud service provider and a tenant side. When the two are combined (i.e., the customer contracts with a service provider), cool stuff starts to happen. Not only does Veeam Cloud Connect enable the service provider to store a copy of the data (one of the 3), it’ll do so on separate physical media (one of the 2) and it’ll be off site, too (the 1.). This is effectively an off-site backup, delivered as a service. In v9, Veeam Cloud Connect extends this BaaS feature set to support off-site recovery (as a service) as well. I won’t bother you with the specifics of BaaS, DRaaS and Veeam Cloud Connect. You can read up on those here. I addition to this, I found three more unexpected and awesome ways to use Veeam Cloud Connect, and I want to share them with you! The first use case I want to dive into is actually the reason we started using Veeam Cloud Connect in our environment. As I was building out the IaaS platform for OGD ict-diensten, I needed a surefire way of onboarding customers from their on-prem data center infrastructure to the IaaS platform. Luckily, the majority of them already run Veeam Backup & Replication, because we’ve been implementing Veeam’s solutions for many years before starting work on our IaaS platform. This makes using Veeam Cloud Connect as a migration tool to move on-prem workloads to our IaaS-platform in a secure and multi-tenant way pretty easy: no network (VPN) setup, no manual VMware or PlateSpin Converter jobs (remember those days?) and no change to the customer environment. 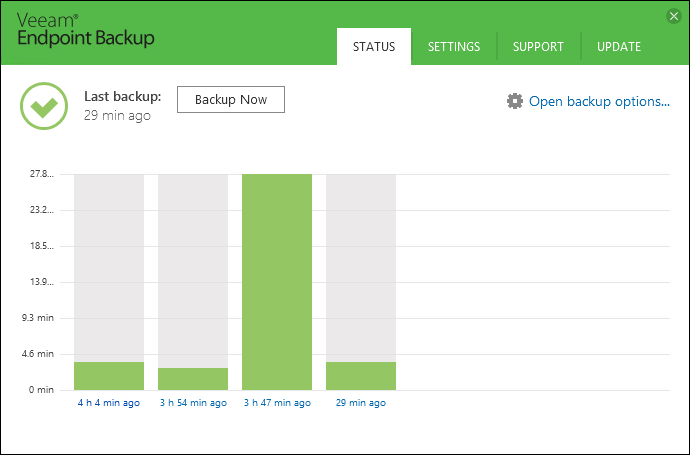 As a side note, I’m pretty excited about the newly announced Veeam Managed Backup Portal for Service Providers, because this allows us, as a MSP, to take better care of the various customer Veeam installations from a centralized web portal. Timing and planning. In infrastructure projects, big bang migrations are no picnic. That’s why I sometimes prefer the trickle migration strategy to the big bang strategy. Luckily, Veeam Cloud Connect allows for both! Transport medium. Depending on the backup copy size, the bandwidth available and the daily delta, transferring the backup copy over the internet (or a dedicated line) is a feasible option. Sometimes, any of these variables will exceed acceptable values, forcing the copy to be transferred via an offline (pre-)seed. Again, Veeam Cloud Connect supports both, even in a VM-level granularity! Hypervisor. Veeam Cloud Connect can even migrate across hypervisors. Well, not really initially, but with a little extra effort, it really can. Really? Cross-hypervisor migrations? With flexible planning or transport medium? Sure! Although not explicitly supported, I think this is one of the major use cases for Veeam Endpoint Backup FREE (recently announced for Linux, too). To make this even more awesome, it’s not just cross-hypervisor, but it’s also completely cross-platform. The source can be physical (Windows and Linux!) or virtual (again, Windows and Linux), and the restore can happen again on a physical machine or on any supported hypervisor (vSphere and Hyper-V). Add this into the mix of the previous migration use case, and you’ll see the combination of Veeam Cloud Connect and Veeam Endpoint Backup is just awesome! Many of our customers have requirements to run certain applications on physical hardware, still. 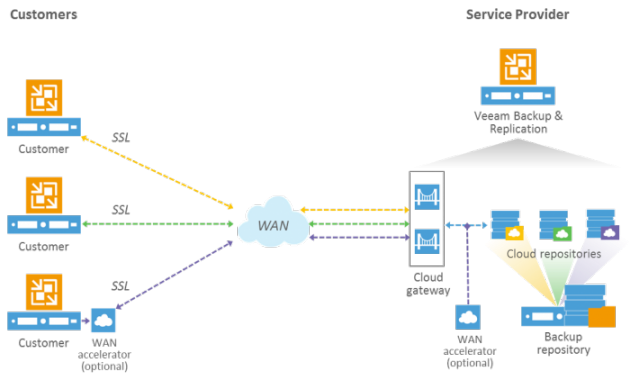 For these scenarios, we’ve set up a colocation facility and integrated it into our IaaS platform using NSX-v VLAN-to-VXLAN bridging. 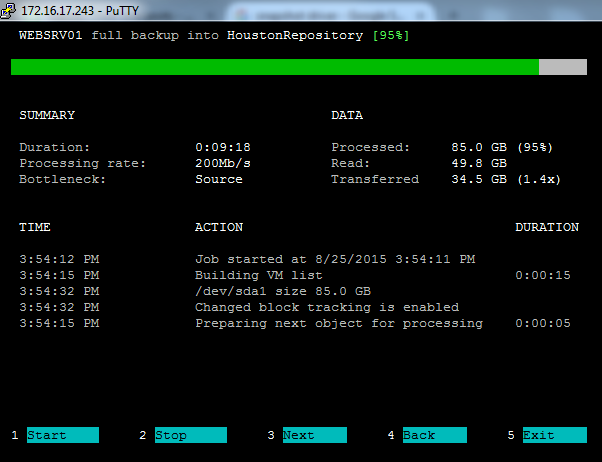 Veeam Endpoint Backup protects those machines using the IaaS platform’s data protection platform! For this use case, it’s important to keep in mind which version of Veeam Backup & Replication we’re referencing, as v9 introduces a boatload of new Veeam Cloud Connect features in the disaster recovery area. As a reference, the Veeam Cloud Connect features in v8 are more BaaS-focused, and the v9 features are more DRaaS-focused. To keep things simple, I’m going to assume we’re going to want to run the latest and greatest. Just as with regular Veeam, each job type has a specific function. With Veeam Cloud Connect, this is no different. For BaaS-purposes, you’d use a backup copy job to the service provider. For DRaaS purposes, you’d use a replication job. Veeam Cloud Connect adds a couple of new constructs to present the off-site compute resources: the cloud host, the self-service web portal (with single-click failover) and the transparent network extension. This blog post wouldn’t be awesome without an added bonus, so here it is. One major drawback I hear my customers talking about is lock-in. They don’t like it, and frankly, I don’t want anything to do with it. Why would a customer have all these great MSPs to choose from if all they’re going to do is lock themselves in? Make sure the customer can always leave. Let’s start with that last point. Why on earth should the service provider empower the customer to be able to leave at any point, without communication, assistance or paperwork? To make sure the service provider lives up to its full potential and strives for perfection! In my view, a key differentiator for service providers is their ability to really manage the customer relationship and add value to their business. Embracing and dealing with customers who have a solid exit strategy is one way of doing so. For us, this means setting, meeting and improving on SLA goals in terms of Availability, recoverability and functionality to deliver the best service we can and add more value for customers. The way we do this is by automating all features needed for the exit strategy and exposing them to our self-service portal. This way, customers can execute the plan independently and transparently. By the way, we make sure the customer can get their data out in an industry standard and platform-agnostic way, and the customer doesn’t pay extra (other than the usual bandwidth or storage capacity charges). This, in turn, prevents customer lock-in. Veeam Cloud Connect is an awesome piece of technology, and I’m happy to have chosen it for our IaaS, BaaS and DRaaS services. I hope these three (plus one) unexpected and awesome ways of using Veeam Cloud Connect will inspire you to look into a Veeam Cloud & Service Provider partner in your area and incorporate these tips into our own environments!